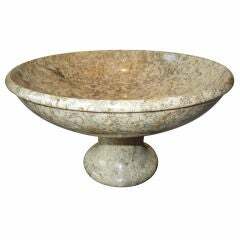 A studio crafted large ovate white alabaster bowl, perfectly crafted and polished, good center piece, and food safe. A monumental large white onyx bowl, free edge, translucent, beautiful with a small candle light in center, one of a kind. Large Chinese punch bowl hand panted fish and foliage design. Having a chop mark to the back having the Qianlong (1644-1912) mark.